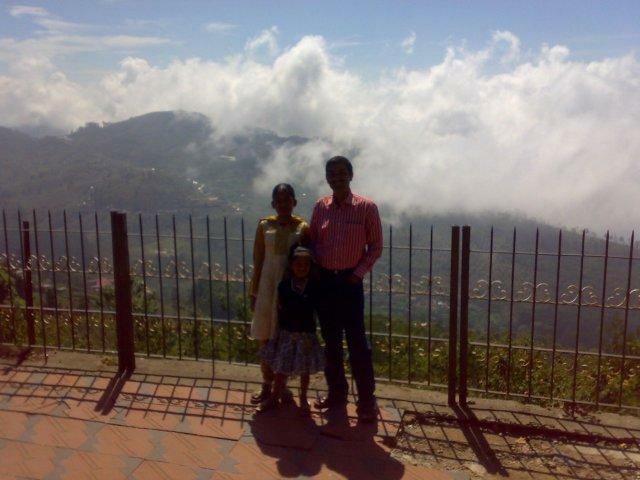 Summer sojourn to Kodaikanal - Ghumakkar - Inspiring travel experiences. 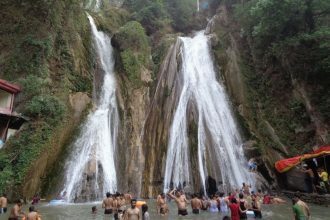 Usually, I don’t go on any trips in summer months, because the only places we can enjoy in summer are the hill stations and invariably all the hill stations will be crowded during summer. 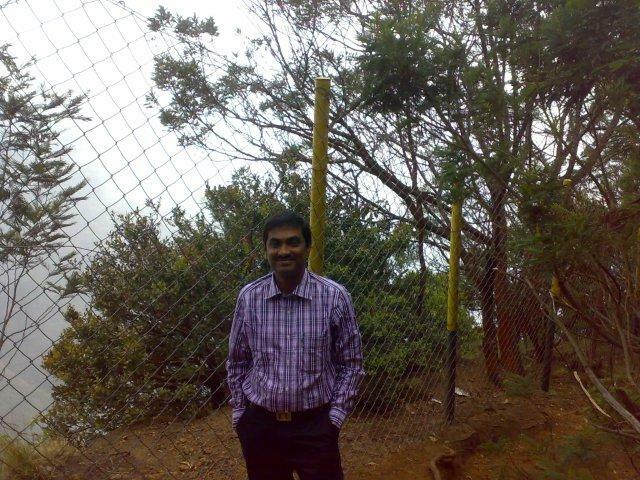 But this time to beat the extreme heat in Tamilnadu, I decided to take a break and visit a hill station. 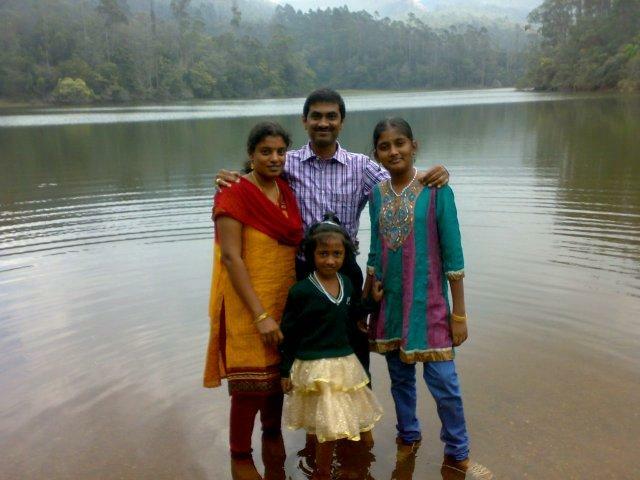 My wife was pleasantly surprised on hearing my decision and suggested that we go to Kodaikanal. 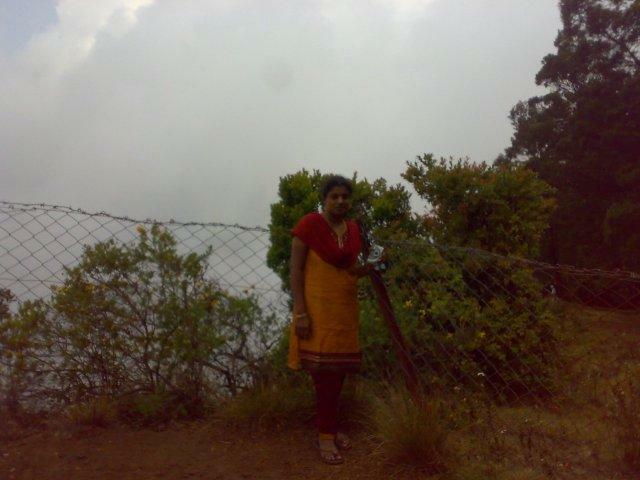 I readily agreed for it had been a long time since I had been to Kodaikanal. 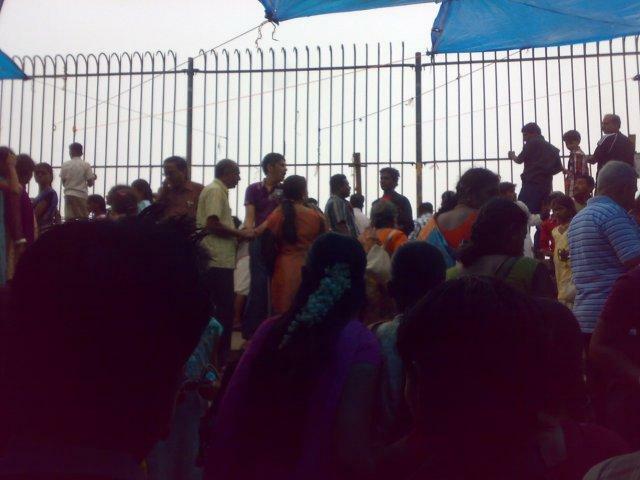 We started early on the morning of April 14, the day after the elections and also the Tamil New Year’s Day. 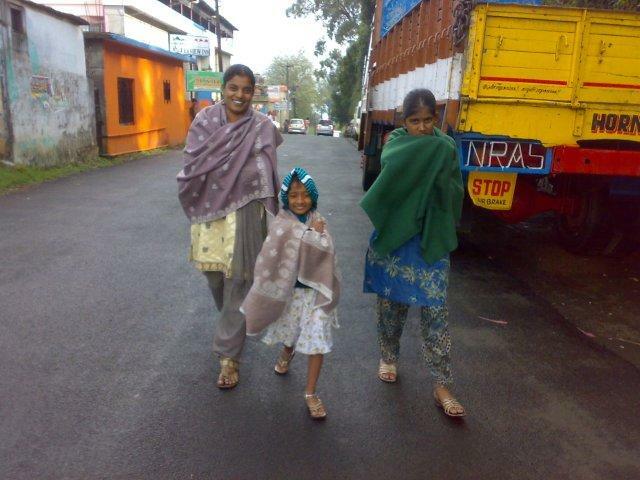 We took the 5.40 am bus at Tirupur bus station to go to Palani(83 kms from Tirupur), our transit point on way to Kodai. We reached Palani, the famous pilgrimage centre at 7.40 am and had our breakfast there. 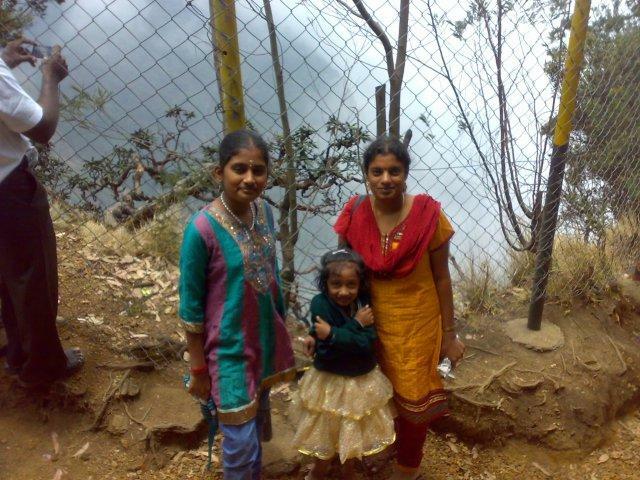 From Palani, we took the bus to Kodaikanal, 65 kms away, at 9.15 am. After a tiring but thrilling journey through picturesque ghat roads and scenic locales, we reached Kodaikanal at 12.15 pm. The total distance from Tiruppur to Kodaikanal is around 150 kms and the driving distance is roughly 4.5 to 5 hours. On reaching Kodai, I checked in at Hotel Valley View which I had already booked through phone. The hotel is situated just 500 metres from the bus station and is very good value for money. They charged 1650 per night(the rates are less in off-season) and the rooms were excellent. Also, the room service and food at the in house restaurant was first rate. After checking in, we freshened up and went out for lunch. Since we like to check out little known but locally popular eatouts in our trips, we selected a small restaurant named Barkath hotel, near the bus stand which was already crowded at 1 pm. The food did not let us down, and the combo of Mutton biriyani and chicken curry was terrific. Just as we were leaving the hotel after a hearty lunch, it started to drizzle and then it turned heavy and we aborted our trip to the lake midway and returned to our hotel. We heard from the locals, that during this time of the year ie April and May, it usually rains around mid-day and the sky clears up in late afternoon. So we took some much needed rest at the hotel and once the sky cleared up around 3.30 pm , we hit the road again and took an Omni van to reach the boat house at 4 pm. (There are no auto rickshaws permitted inside Kodaikanal town and Maruti Omni’s serve as local transport). As the weather had cleared, there was good crowd at the boat house. 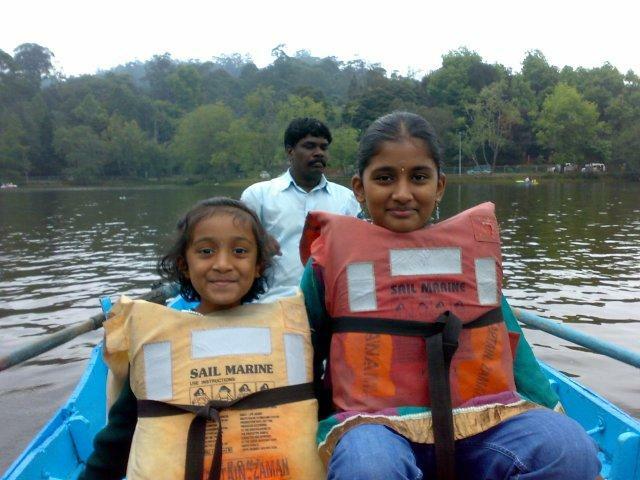 We booked our tickets for a Pedal boat(Charges: Rs.80 for a 4 seater pedal boat for a 30 minute ride).We had to wait a little for our turn. The mid-day shower had turned the weather chillier and it was exactly what we were hoping for when we planned this trip. It was great relief from the hot plains. We had a wonderful time at the boat ride. 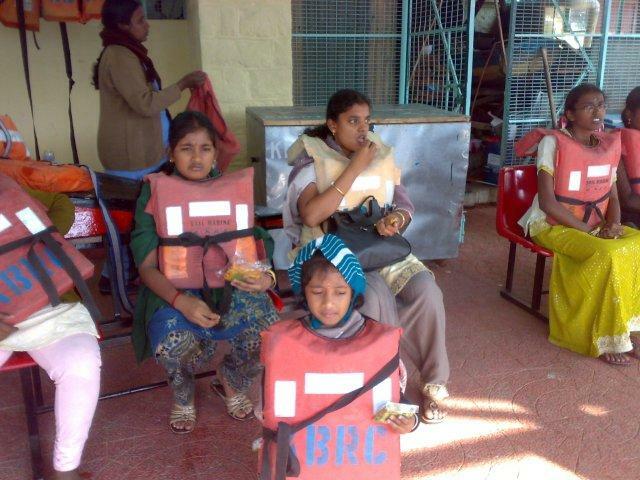 Then we stepped into the Canteen adjoining the boat house and ordered some hot snacks. The cold climate and boat pedalling had really whetted our appetite and we ate to our heart’s content. 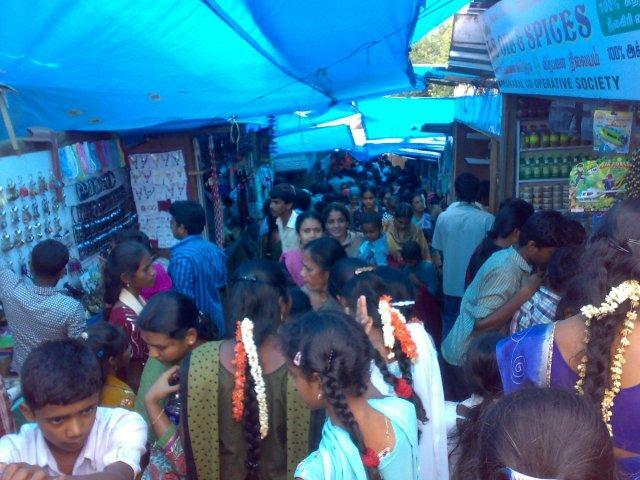 Then we took a relaxed stroll through the various shops lining the lake and did some purchases. Then after a light dinner at the famous Astoria Veg restaurant(always crowded irrespective of the time of the day) we retired to our rooms at 8.30 pm. After a good night’s sleep, we got up early and had breakfast at the hotel restaurant. Although, the quality of the food was good the service was very poor because of lack of staff at the restaurant. Then we waited at the lobby for the van(arranged by the hotel) to take us to the trip to Berijam lake,21 kms from Kodaikanal town and the tourist spots on the way. 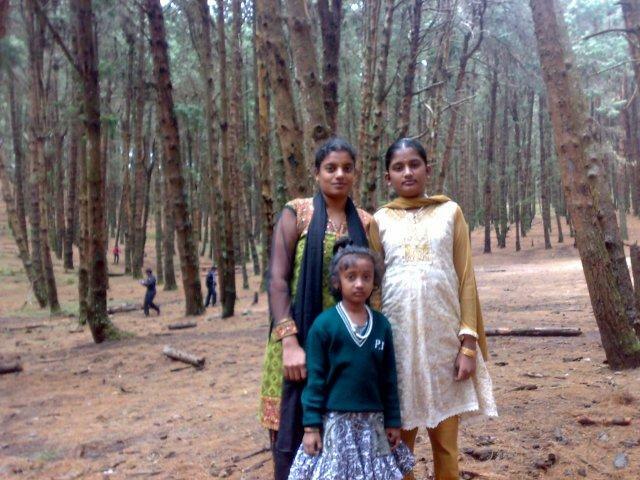 You need a permit to visit these places, and they can be obtained at the Office of the Forest Officer in Kodaikanal. Thankfully, the hotel arranged for the permit. The van arrived at 10.30 am. From the hotel to the Forest entrance check post 7 kms away, it took 90 minutes to travel because of the heavy peak season rush. After crossing the check post, the traffic was much lighter and we reached our first spot, the Silent Valley View. As the name suggests it is the view of deep(thousands of feet) valleys with precarious edges. Most of the places on these route, have been neatly fenced because of human fatalities which had occurred in the past.The view of the valley alternating between mists and sunshine was a sight to savour. Our next stop on the way was a Firewatch tower, which was in unusable condition because it had become too old and the steps had become too weak to withstand the climber’s weight. From there we moved on to Cap Fly Valley, a famous spot seen in numerous Tamil movie song sequences. The edges of this valley have also been completely fenced for almost 500 metres, to avoid any fatal accidents. The misty climate at the spot and the interplay of sun and clouds were a feast for the senses and we had to drag ourselves reluctantly back to our vehicle.Our final stop was the Berijaum lake, 21 kms from Kodaikanal town. We reached it around 1.30pm, sat by the lakeside along with other members of our group and enjoyed the snacks we had purchased along the way. The point to keep in mind here is that there are no restaurants anywhere along the way in this trip, so one has to get all their food and snacks in Kodai town. Our van returned to Kodai town at around 3.45 pm. The Charges for this trip was Rs.180 per head(including forest permit charges and checkpost entrance fees). We got down at Hilltop Restaurant for our belated lunch. Even at that time, the restaurant was crowded and we treated ourselves to Tandoori naan and butter chicken. 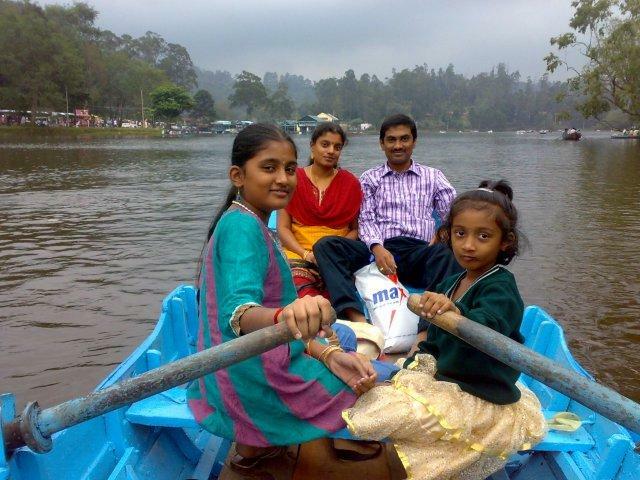 From there, we strolled to the nearby boat house(All trips around Kodai end either at the lake or at your hotel). We took the rowing boat and enjoyed a relaxed half hour ride(Rowing boat charges: 20 per head plus 35 rs for the rowing man). We spent the chilly evening at the park near the lake and returned to our hotel at 8.30 pm. After breakfast again at the hotel restaurant, we vacated our room at 10 am. Since our bus booking to Palani was at 4 pm, we booked a Maruti Omni for a trip to the tourist spots within Kodai town(Rs.700 for a 4 hour 30 kms trip). Our first stop was the famous Coakers’ walk, Kodai’s most famous picture postcard landmark, just half a mile from the bus stand. This is a beautiful stretch of well laid out walkers’ pavement alongside a beautiful valley right in the middle of Kodaikanal town. The weather when we reached there at 10 am, was gorgeus with sun and clouds enveloping the valley alternatively. There is a telescope tower at the entrance to this place, from where we can view the towns of Periyakulam and the plains below. We had delicious ice creams at this place and moved on after taking our quota of photographs. Then after a brief stopover at Upper lake view point we reached the pineforest just before Guna Caves. 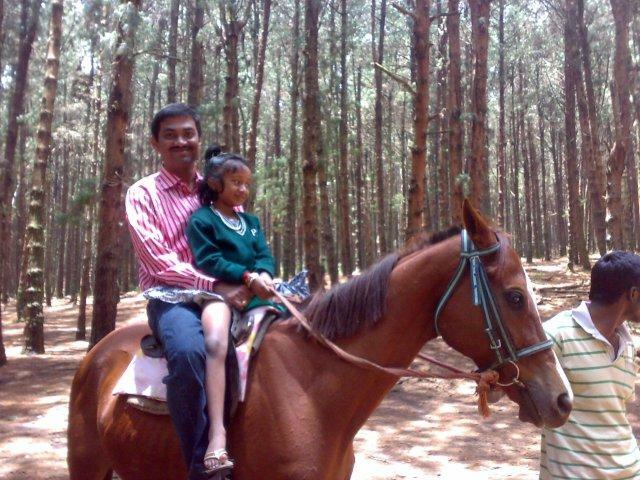 We took a horse ride(100 rs for a 10 minute roundabout)at the pineforest.Then after skipping the heavily crowded touristy spots of Pillar Rock and Guna Caves, we reached Green Valley View(or)Suicide Point. 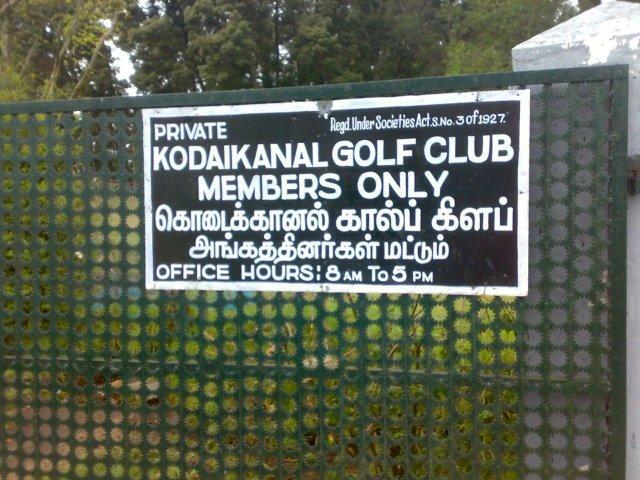 This place is adjacent to the Kodaikanal Golf course. The path to Green Valley View has been heavily commercialised and shops selling souvneirs, caps, key chains etc can be seen lining both sides. 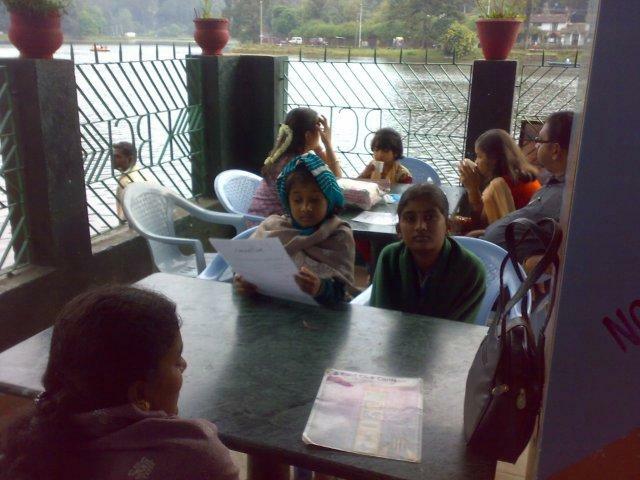 We reached Kodai Bus station at 2 pm and had a light meal at a nearby restaurant. Our bus departed at 3.45 pm and reached Palani at 6.30 pm. From there we took our connecting bus and reached Tiruppur at 9 pm. 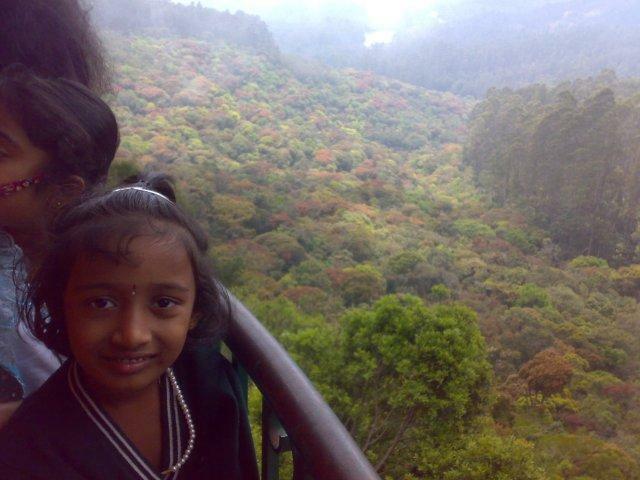 a very well written post on kodaikanal….though i have visited lot of places in nilgiris…somehow could not visit kodaikanal …hope to visit it soon and ill read ur post again before travelling there…. Venkat , Very nicely narrated. Very nice family pics . 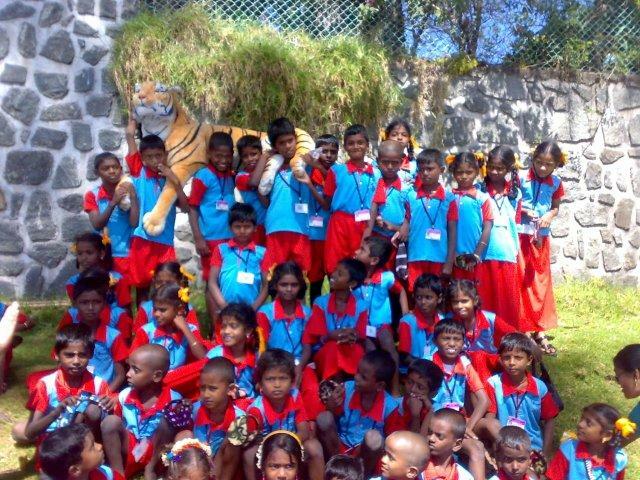 I have been to Tamil Nadu few years back and visited Coimbatore , Ooty and Coonoor . 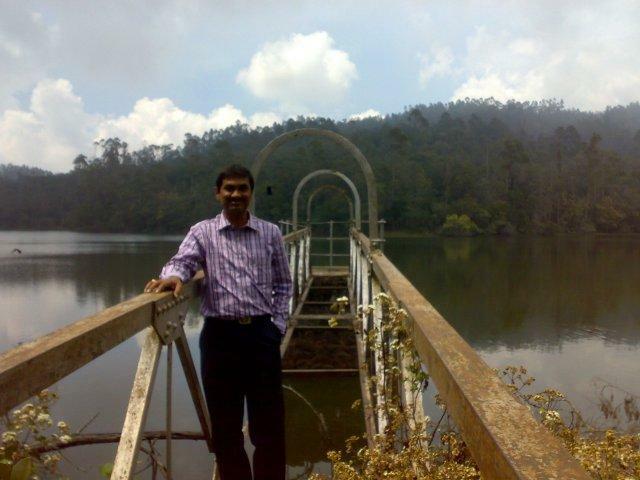 I have never been to Kodaikanal. 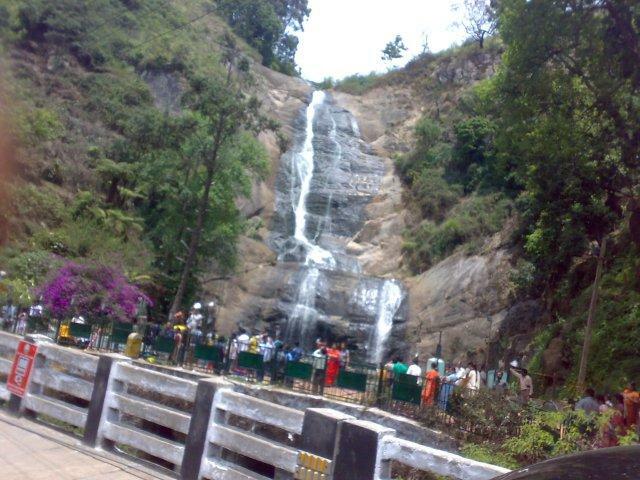 Hope to visit it sometime when I will next come to Tamil Nadu . Sahil, Kodaikanal is not a place to be missed. U will fall in love with it, especially if u come in less crowded winter months. A beautiful story with good photographs. The fog in the mountains is my most favorite panoramic views. I mean they look like the mountains are covered with a lot of candy clouds. 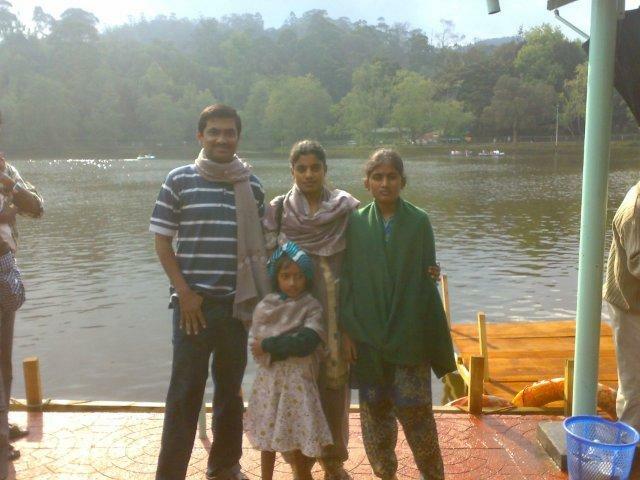 I have been to Kodaikanal almost 18 years back when it was not so popular for our Annual Meeting. That time we saw hardly couple of North Indians there. Thanks for refreshing the memories. From Chennai to Kodai Road we used meter gauge train, I don’t know still its in use. Mahesh, train facilities to Kodai Road have vastly improved now. Even otherwise, the city of Madurai,120 kms from Kodaikanal, is easily connected to all parts of Tamilnadu. 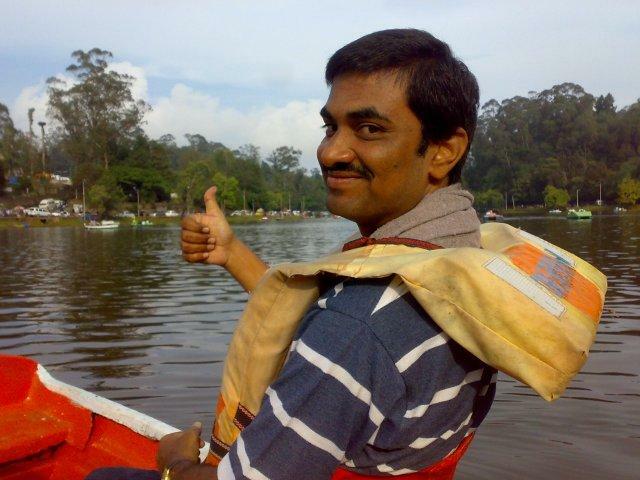 I am Sridhar from Hyderabad.Planning to go Madurai,Kodaikanal and Palani. Simple and beautiful story.Your story is guide for me at Kodai. thanks venkatt, for such a well written and detailed post. You had great time there. Thanks Vinay for appreciating my post. This detailed information will be helpful to us in planning our trip. सहस्त्रधारा में अंदर घुसते ही 10 रूपये/बाइक एंट्री फीस लगती है जो हमने दिया और अंदर चले गए. वहाँ जाकर हमने बाइक को एक दुकान के आगे खड़ा किया और दुकान वाले से दो लॉकर किराये पर लिया (50 रूपये एक लाकर ). अपना बैग और सामान लाकर के अंदर रखने के बाद हमने दुकान वाले को चाय नाश्ता के लिए बोला और पानी में नहाने के लिए चले गए. अंदर पानी बहुत ही ठंडा था और वहाँ पर स्थानीय लोगो ने जगह-जगह दिवार बनायी थी इसलिए वह किसी स्विमिंग पूल की तरह दिख रहा था.